Nowadays, the business world comes along with an abundance of new customer’s requirements and an issue of finding a right online shopping cart to fit the company’s demands. Whether you're searching for a simple-to-use, advanced or budget-friendly solution, it is recommended to take your time and thoroughly research all required information about the online shopping carts. Lately, GoDaddy and Shopify get tons of praise among the organizations of different shapes and sizes. Let’s go over the GoDaddy vs Shopify comparison to help you choose the desired one and learn the main aspects on how to migrate from one to another. Regarding the interface, GoDaddy and Shopify are considered as the simple solutions. The vital difference is that when it comes to more comprehensive and sophisticated dashboard of the sales, orders, and traffic, Shopify takes the upper hand here. It helps you make right business decisions. In online business world, the look and feel of your website can have a significant impact on how the company is perceived. So, GoDaddy offers the compelling themes managed by the WordPress Themes Gallery. You get 8 pre-built customizable pages, easy drag-and-drop page building, and simple access ta wide range of WordPress plugins. Basically, there is no limit to what to build. You can obtain the automatic setup, backups and software updates. 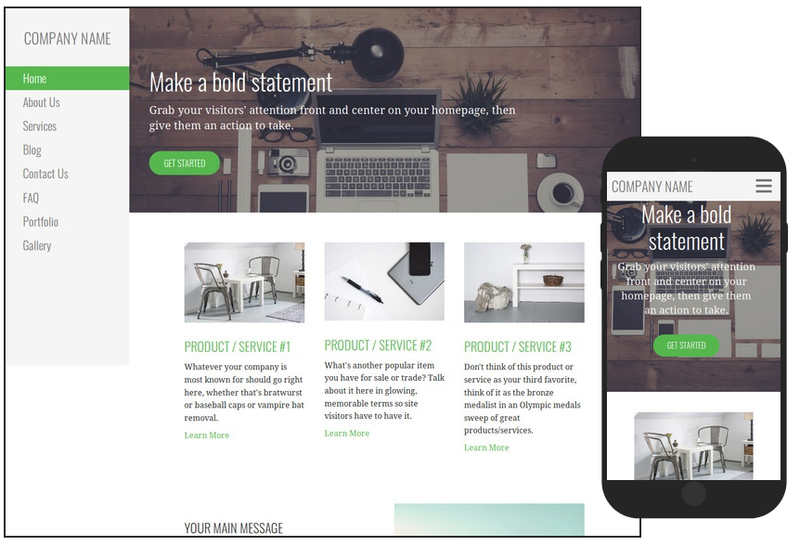 While talking about Shopify designs, the platform includes extensive collections of free and paid themes that can help you find suitable e-shop look. Since the solution is one of most popular online shops on eCommerce market, you just need the inspiration and discover styles to start building your brand. As the solution is mobile responsive, your clients can browse the e-store on any device and on the go. launch the promotions by offering the coupon codes that help your clients save money and get more interest in your product or service. get Google Adwords credits. To be more specific, get $100 towards Google advertising if to spend $25 with Google. notify the clients of the upcoming sales and new products with help of the email marketing automation tool like MailChimp. What generates the traffic to your website and improves SEO? Blogging is one of inevitable parts of your marketing strategy, and that’s where GD falls short. Shopify stands out for powerful, comprehensive and simple-to-use blogging functionality. The platform offers custom dashboards, the opportunity to write articles, embed videos, promote open discussion among your visitors, and moderate comments swiftly and efficiently. Regarding Shopify, every e-plan contains free 256-bit SSL certificate. All pages, content, credit card, and transaction data are guaranteed to be protected by same level of security used by banks. Online Store - $29.99/mo (359.88/yr) after. When you are selling online, it is essential every transaction is secure and satisfies the clients’ demands. Moreover, a number of issues can occur without the correct payment gateway. So, taking into consideration Godaddy Vs Shopify comparison, GoDaddy does not integrate with that much of them. Shopify connects over 100 gateway options that are divided into 3 sections: major, international, and additional payment gateways by country. The most popular ones are PayPal, stripe, 2Checkout, First Data, Affirm, Amazon Payments. One more aspect to consider, with Shopify you will be charged up to 2% for transactions via external payment gateways. This is is one of the main disadvantages using this eCommerce solution. Everybody knows about the importance of the customer service to retain and satisfy your customers. Regarding the GoDaddy online store vs Shopify support, both platforms offer the great phone, live support, and simple to find articles to help evolve their online shop. The difference is that Shopify offers 24/7 professional assistance and offers eCommerce discussion forum. You can easily explore what you require and interact with a large Shopify community. 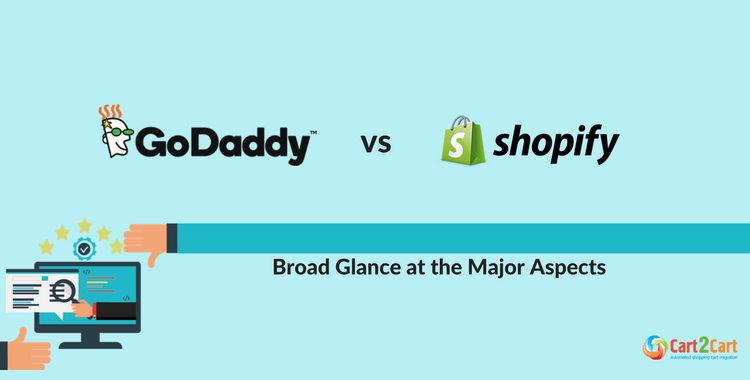 By and large, the Shopify vs GoDaddy comparison explains that GoDaddy is initially created to be a website builder, while Shopify is designed to help you manage e-shops. The call is clear: if you are the newbie and looking for cheap hosting, quick domain name registration, unlimited domains, and emails, then GoDaddy is your choice to consider. Besides, Shopify is a great choice for companies that are constantly evolving as platform is optimized for the organization's growth. With the help of the Shopify app store, you get an opportunity to expand your business, enhance company processes and sell more. 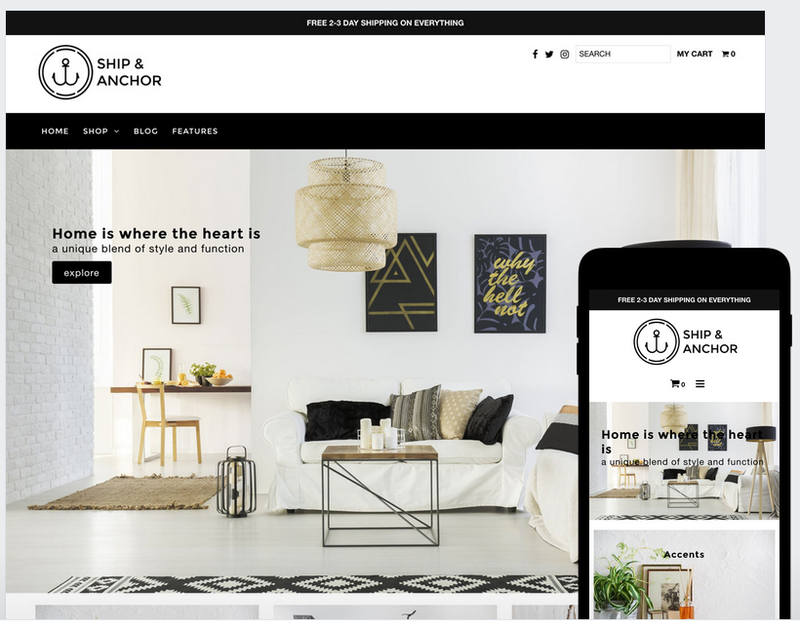 Check these 11 Innovative eCommerce business models you san integrate with Shopify and explore more benefits from Shopify Import. Who Wins the GoDaddy or Shopify Online Store Rivalry? As you can see, Shopify bits GoDaddy in almost all positions. Your task is to choose the solution that fits your company needs and budget. Hence, if you decide to perform GoDaddy to Shopify migration, you can take advantage of Cart2Cart automated migration service. The SaaS enables you with a number of the valuable features like the total uptime of the current online store, guaranteed security, 24/7 support, a variety of imported entities, etc. Also, you can check the service in action and investigate functionality of your future online shopping cart by using a free Demo Migration. Don’t waste your time, try the test shopping cart transfer immediately!